Set in the 13th century, this sweeping historical novel opens on the island of Torcello, outside Venice, in 1219, after the Crusaders have lost possession of Jerusalem. Yehezkel, a young yet revered kabbalist and student of Maimonides, is on the island for a secret meeting of rabbis. He is chosen to travel to Jerusalem to seek definitive proof of the Talmud’s antiquity, a search that grows to include the hunt for the mysterious Parchment of Circles. This ancient map could not only help Yehezkel’s quest, but also lead to explosive evidence about Christ’s resurrection that would destroy the Roman Church. Before leaving the island, Yehezkel rescues a young Cistercian abbess from drowning in the Venetian Lagoon. Galatea, the beautiful nun, has been plagued by mystic visions and prophetic dreams throughout her life, leading her to become a devotee of Hildegard von Bingen. Driven by premonitions of an “enigma in Jerusalem,” she abandons her monastic life and the orthodoxy of the Church and joins Yehezkel on his pilgrimage. On the way to Jerusalem, after being shipwrecked on Crete, the two meet St. Francis of Assisi in Cyprus and join him across the lines of the Fifth Crusade in his attempt to convert the Sultan of Egypt. Over the year-long trip, they also fall in love. 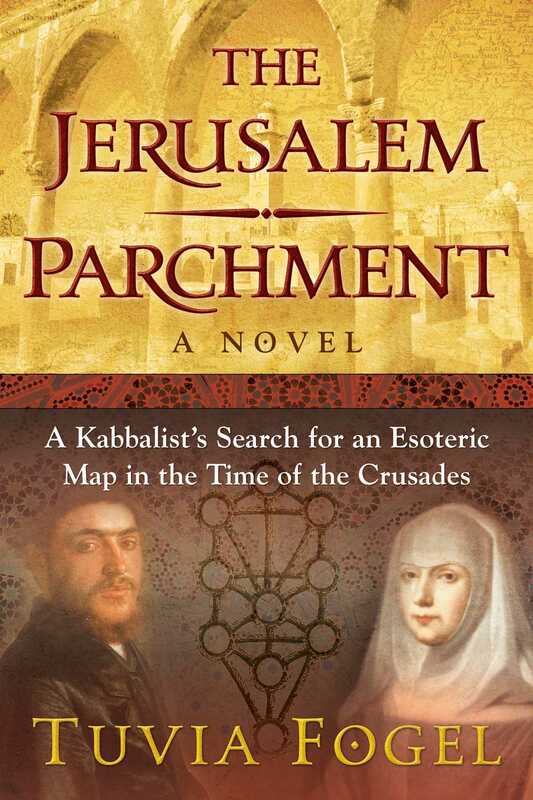 But the rabbi and the nun are not the only ones seeking the Parchment of Circles: The Pope sends his agents in search of it, and the Knights Templar are also in pursuit of the Parchment, for the ancient map serves as the Templars’ blackmail against the Church. What none of these deadly adversaries know is that the Parchment leads to an even more startling secret with profound religious significance for the future of humanity. It’s not a question of who finds it first, but who survives to unlock the Parchment’s secrets. His audience of a Christian, a Cathar, and a Jew leaned forward, intrigued. “Yes, I can try that, but you’ll have to fetch a wax tablet,” said Yehezkel. Ten minutes later they followed his lesson as he played with letters and numbers. The Old Man’s bony hand went up immediately. He started scratching and soon the tablet was covered with figures. “These are not all words,” he said with a smile. “At least, not in this cycle of the universe. They’re just all the combinations of three letters that add up to 153.” His audience was puzzled. Yehezkel began scratching out the words that meant nothing in Hebrew. The nonwords vanished under Yehezkel’s strokes. In a remote corner of their minds, the three assorted Christians wondered if they hadn’t embarked on a magical, possibly dangerous Jewish ritual. The mystery of the 153 fishes permeated the silence in the apartment. In the end, Yehezkel raised his head, smiling. He had rubbed out all eighteen words. They all stared at him. The Old Man, who had toyed with the riddle for the best part of a century, wasn’t even breathing. Yehezkel wrote a single, large three-letter Hebrew word on the tablet and handed it to Galatea. Scratched in the wax were an Ain (70), a Gimel (3) and a Pey (80). For the last 20 years, Tuvia Fogel, the son of Transylvanian Holocaust survivors, has worked in Italian publishing, first as a non-fiction editor and then as a literary agent. Fluent in 5 languages, he lives in Milan, Italy.